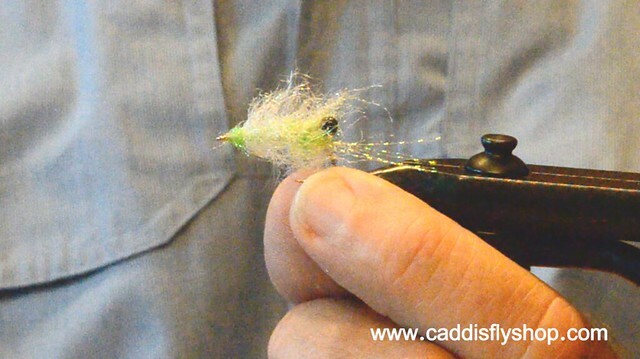 This fly is one I developed after reading about euphausiid pattern that a fellow tyer angler tied and fished successfully for Coho Salmon in Puget Sound. This fly is a little different but substantially the same effect as his – and this fly has earned its keep here offshore Oregon of late. Like any non-batfish fly, this is an offshore fly to consider when Rockfish and salmon seem un-receptive to their usual and typical prey types. Shrimp, Krill, Crab Spawn and all the terms anglers use referring to such foods can be a selective target to ocean predators, and when they want the little stuff, you’d better be offering it up on your tippets, cuz the best Clousers and Deceivers will often be ignored over a fly of this style. Sometimes I will tie this fly with bead Chain (black of course) or Black Pseudo Eyes, but when fishing in the top few feet of the ocean or estuary, the EP eyes will give me a fly that will stay in the proper depth zone longer than a fly with heavier eyes. The EP shrimp dub brushes are a marvelous discovery to me, and I’ll be surprised if you don’t find a lot of uses for them in your tying as well. This entry was posted in Fly Tying, Fly Tying Materials and Supplies. Bookmark the permalink.